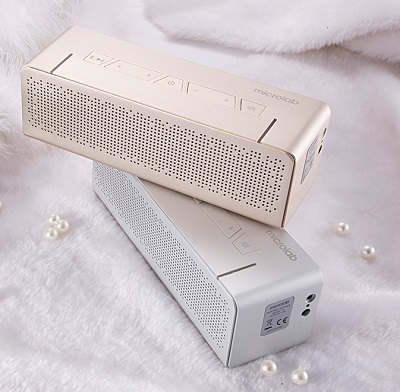 T5 is a stylish portable speaker with Bluetooth ® wireless technology. It can easily connect to smart phones, tablet PCs and other digital devices without cables. 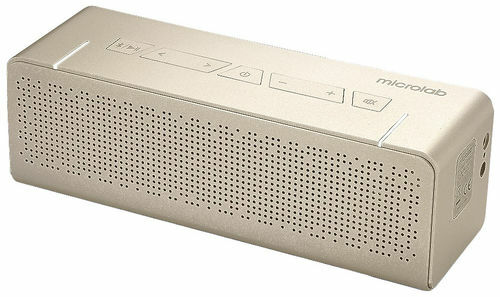 Small soundbar system with two quality speaker drivers. Uniquely designed air port for enhanced mid sound production. Sounding like CD, it will bring you a wireless music feast. Ideal for home, office, etc. Designed with silver metal skin, simple and exquisite appearance. It is not only a great stereo speaker but also a pretty ornament, which is a perfect choice for trendsetters. The control buttons are at the top of speaker. With the internal lithium battery, it can offer you 4 hours wireless music playtime. Give you excellent entertainment for ears and eyes.